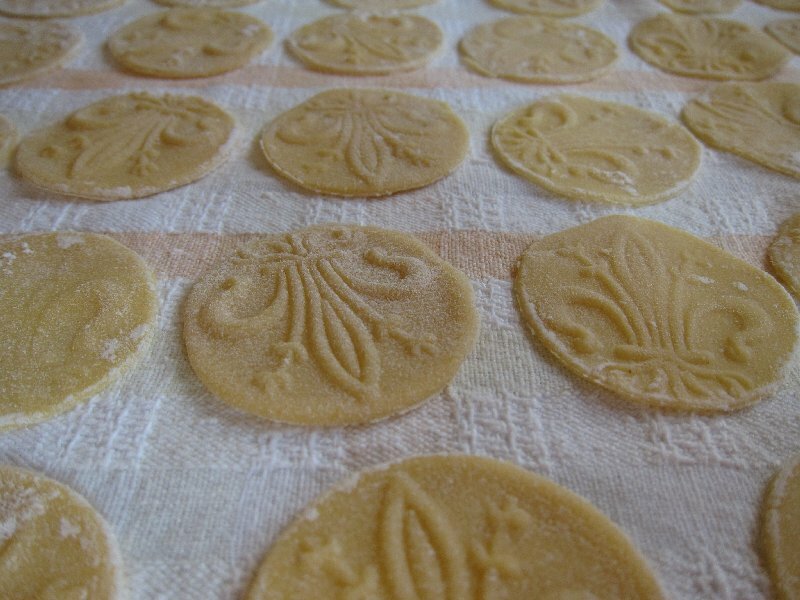 I love making unusual pasta shapes and forms and one of my favorites are corzetti, a disk shaped pasta with an imprinted design; the below corzetti have a giglio fiorentino (fleur de lis) design. The Encyclopedia of Pasta, by Oretta Zanini de Vita and masterfully translated into English by Maureen B. Fant, dedicates a two page description to corzetti, along with drawings of corzetti and the corzetti stamp tool. Corzetti don’t always have a giglio fiorentino design like the ones pictured below; in Liguria one stamp features a coat of arms with a rampant lion. In addition to its decorative function the design also helps the sauce adhere to the pasta. I used some of our remaining frozen tomatoes from last summer’s garden to make a simple tomato sauce of olive oil, garlic and basil. This isn’t the traditional sauce for corzetti, but it was a perfect marriage with the pasta. In Liguria, where corzetti were first made, pesto is the traditional sauce. There are only a few artisans left in Italy who make hand-carved corzetti pasta tools and one of them is Filippo Romagnoli from Romagnoli Pasta Tools. He lives just a half an hour’s drive outside of Florence. We’ve been in touch for years now and yesterday I finally managed to visit his artisan studio. During the Renaissance there were many wood intagliatori (wood carvers) who carved exquisite pieces of furniture, mantletops and other wood items including corzetti stamps. At the time intagliatori were numerous and in great demand. If you are familiar with the lovely Coppedé neighborhood in Rome you’ll know that it was designed by the Florentine architect, Gino Coppedé. Before he became an architect he was an intagliatore with his family’s company Casa Artistica Coppedè. Filippo Romagnoli’s grandfather’s teacher collaborated with this well-known Florentine company. Filippo Romagnoli is the third generation of intagliatori in his family and he will most likely be the last. When his grandfather started off in business at eleven years old he carved many things from furniture to hand-carved corzetti. His son eventually took over the business, and now his grandson Filippo. Filippo hand-carves exquisite, made-to-order corzetti, plus beautiful cutting boards, rolling pins and other beautiful wooden culinary tools. According to Filippo, he is one of three remaining hand-carved corzetti makers left in Italy: the other two are in Liguria where corzetti pasta was invented. One of these artisans is 93 years old and the other is in his late seventies. Filippo already has many working years under his belt and will probably start thinking about retirement in another decade or so. For the most part Filippo works on his own with some help from his grandson on the administrative side. Demand for anything hand-carved has diminished to a very low level. Most wood furniture these days is greatly simplified and often factory-made. From an economic standpoint this makes it hard for true artisans like Filippo to survive. You can order directly from Filippo, or through his store on Etsy. It’s possible to purchase some of his traditional corzetti designs or to custom order your own. Filippo is making me a corzetti stamp with my Flavor of Italy logo. Some people have ordered designs with a family name, and restaurants with their restaurant logo. Filippo just made 100 stamps for a couple to use as gifts at their wedding reception. After my visit with Filippo in his artisan studio and seeing the quality of his hand-carved corzetti it’s clear that they are far superior to any machine produced corzetti you can purchase. How are corzetti stamps made? The first step is to begin with a rectangular block of wood that measures roughly 8 inches by 2.5 inches. The wood used should be a quality wood that will maintain its shape and not deform or warp over time. The piece of wood is then honed down and shaped to form a cylinder. One end of the cylinder is then carved to form a handle. The cylinder is then cut into two pieces. From the opposite end of the handled part of the cylinder a design is carved following a design on paper. This part is tricky as the design is a mirror image of what you see on paper. So if there is lettering in the design it will be carved in backwards, or as a mirror image of the design. The design is carved using different wood carving tools. A round corzetti cutting tool is then carved out of the second piece of the cylinder. It’s important to use the second piece from the same cylinder for the corzetti cutting tool so it perfectly matches the diameter of the corzetti stamp piece. If different pieces of wood are used the diameters might not match perfectly. On the opposite end of the cutting tool another design is carved; it could be the same design as the stamp, or a different one. Filippo always makes a clay replica of his designs to have an inventory of all his designs, along with the paper design. Corzetti tools are never varnished. Filippo finishes them with an oil, usually vaseline oil. How should you care for your corzetti tools? Store your corzetti stamps in a box or container so that the wooden cutting tool doesn’t get chipped. You should regularly rub the corzetti tools with vaseline oil, and natural bees wax, to keep the wood supple and to avoid cracking. If any pasta gets stuck in the stamp design clean it carefully with a tooth brush, and if necessary, a little oil to moisten any dried flour in the design. Never clean your corzetti tool with water. Is it possible to purchase commercial corzetti online? The answer is yes, even though corzetti stamps are not common. Here are a few ideas! You might want to order a fleur de lis corzetti stamp, a star corzetti stamp, or an antique coin corzetti stamp. How do you make corzetti pasta? Follow the recipe for making homemade pasta. Make a smooth and elastic sfoglia (sheet of homemade pasta): knead the dough for a good five or more minutes and then roll it out thinly. Cut out as many small disks as possible with the wooden corzetti cutting tool. Then use the stamp to imprint each disk with the giglio fiorentino, or other, design. Wendy you are making me homesick for Italy – and those two wonderful days I spent in the kitchen at your place. Next time I'm in Rome, will you take me to this kitchen shop please?! Gorgeous photos! Glad you liked the shop…can't wait to go back and get more stuff!